Photo from about 1900. Front row: Bonnie Etta Clayborn, Matilda Driver Clayborn, Dewey Driver, William M. Parker, William Elijah Clayborn. Back Row: Mary Etta Driver Parker, Eva Clayborn. William Howard (or Horace) Clayborn was born on 31 March 1857 in DeKalb County, Tennessee, to James and Melinda Clayborn. [1900 United States Census, Civil District 19, DeKalb County, Tennessee.] In 1880 at the age of twenty-three he was still living at home with his parents. [1880 United States Census, Liberty, DeKalb County, Tennessee.] Roughly three years later, on 1 July 1883, he married Matilda Driver in DeKalb County. [Matilda Driver was born in July 1866. See Tennessee State Marriages, 1780-2002, Tennessee State Library and Archives.] Together William and Matilda had six children, all listed in greater detail below. 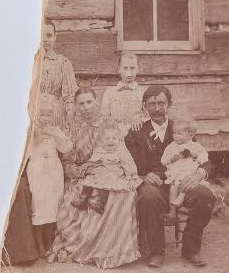 William, Matilda, and their six children were living together in DeKalb County during the 1900 census, but within a year Matilda would die and William would remarry. Charlie Clayborn (click name for separate biographical sketch) was born in March 1888 in DeKalb County, Tennessee, and died on 27 April 1957. Bonnie Etta Clayborn was born on 26 January 1892. 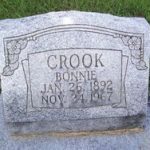 [The birthdate is based on Bonnie’s tombstone, but the 1900 U.S. Census gives 1890 as the birth year. Bonnie’s niece, Dianna, also noted that Aunt Bonnie had the same birthday as Dianna’s husband, Fred E. Curtis, on the 26th of January.] A marriage certificate was issued to Martin Braswell and Bonnie Clayborn on 18 August 1909, however this wedding was never officiated and the wedding license not returned. She married (1st) Charley H. Dodd on 8 August 1914. 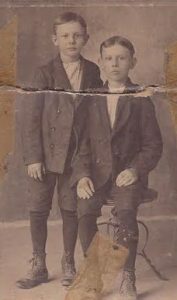 Together they had one child, John Lee Dodd (born and died on 25 July 1915). The death certificate states, “John Lee Dodd, male infant of Charley Dodd B. Gassaway and Berni (Bonnie) Claborn B. Dowelltown. Infant not fully developed. D. 25 July 1915 WH Adams, MD of Liberty Burial by WC Vick of Liberty.” Bonnie divorced Charley soon after for physical abuse. Bonnie then lived with and took care of her adoptive parents, her aunt and uncle, Mary Etta “Minnie” Driver Parker (25 October 1872 – 19 September 1954) and her husband William M. “Bill” Parker (10 July 1865 – 25 January 1951). Later in life, on 29 August 1958 in Cannon County, she married (2nd) Lon Crook. [This marriage license was issued in Cannon County, Tennessee. In it Bonnie gives her middle name as “Etta” and lists “Bill Clayborn” as her father.] Lon was born on 21 May 1889 and died on 2 February 1966. [The death date differs from the Social Security records and is based upon an obituary in the Smithville Review Newspaper on 10 February 1966.] Dianna Clayborn, daughter of William Elijah “Lige” Clayborn related that, “Aunt Bonnie was my favorite of all. She was like a grandmother on the Clayborn side that I never had. I loved her very much, and she loved me in return like her granddaughter, as she did not have any children.”[Oral interview with Dianna Clayborn Curtis on 15 January 2015 by William Freddy Curtis.] 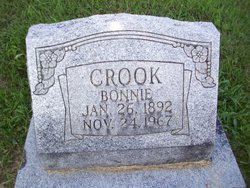 Bonnie followed in death on 24 November 1967 and is buried beside her adoptive parents, her uncle and aunt, Bill and Mary Etta “Minnie” Driver Parker, in the Dismal Cemetery near Liberty, Tennessee. Bertie Mai Clayborn was born on 23 March 1920. She married Ed Driver (born on 9 Feb 1914) on 17 March 1934, just before her 14th birthday. Ed died on 3 September 1968 and is buried in Salem Cemetery in Liberty, Tennessee. Bertie later married William Lillard of Lebanon, Wilson County, Tennessee. Together they had three children listed below. Bertie later married William Madison Lillard (born 1 June 1921, died 28 December 2001) on 2 August 1975 in Lebanon, Wilson County, Tennessee, where they resided. Eddie Wayne Vaught was born in Wilson County, Tennessee. He married Elizabeth Jane Dedman on 12 November 1971 in Wilson County, Tennessee , and they lived in Lebanon, Wilson County in 2007. Together Eddie and Jane had three sons: Jeff Vaught was born in Lebanon, Wilson County, Tennessee and married Sherry; Chris Vaught was born in Wilson County, Tennessee; and Greg Vaught was born in Wilson County, Tennessee. Jerry Vaught was born in Wilson County, Tennessee. Billy Brown Driver was born on 16 March 1938 in DeKalb County, Tennessee. 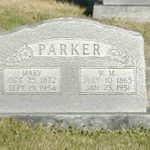 [Copied from Billy B. Driver Tombstone, Cedar Grove Cemetery, Lebanon, Tennessee.] He married Mary Annette Reece on 19 December 1959 in Wilson County, Tennessee. Billy was a 1956 graduate of Watertown High School and was a member of Fairview Church. He worked for the Tennessee Woolen Mills for thirty-five years and retired as custodian from Cumberland University in Lebanon, Tennessee. Billy died on 24 December 2013 at the Quality Care Nursing Home in Lebanon, Wilson County, Tennessee, and was buried in Cedar Grove Cemetery, Lebanon, Tennessee. [Billy B. Driver Obituary, Lebanon Democrat, 26 December 2013.] This couple resided in Lebanon, Wilson County, Tennessee. James E. Clayborn (called “Jim”) was born on 22 January 1922 in DeKalb County, Tennessee. He married Ina Mai Self on 21 May 1939 in DeKalb County, Tennessee. He entered the service of the United States Navy on 1 May 1944. A Seaman First Class, he served on the USS Flaherty. Discharged on 22 January 1946, he was awarded the American Area Campaign Medal, the European-African-Middle Eastern Medal, and the World War II Victory Medal. He and Ina Mae Self Clayborn settled in Davidson County, Tennessee. [DeKalb County Genealogical Society and Justin Potter Library, World War II Veterans of DeKalb County, Tennessee (Smithville, TN: Bradley Printing, Co., 2005), 72.] Together they had one child, Doyle Clayborn. Sherry Gail Hays married M. B. Parkerson on 25 September 1959 in Wilson County. This couple resided in Watertown, Tennessee, in 1984 and Smithville, DeKalb County, Tennessee, in 2015. Jimmie Hays lived in Illinois in 1984. Buford Neal Vanatta was born on 15 July 1920 in DeKalb County, Tennessee, as the son of Tina Clayborn and Clarence Vanatta. He married Jessie Lee Robinson (born 30 January 1926) on 26 October 1946 in Rossville, Georgia. “He entered the US Army in World War II on 18 July 1942 at Fort Oglethorpe, Georgia, and trained there and at Fort Eustis, Virginia. A Technician Fifth Grade, he was with the 229th Antiaircraft Artillery Searchlight Battalion, and served in the Asiatic-Pacific Theater from 21 December 1943 to 21 December 1945, seeing combat in New Guinea and the Philippines. His awards are the Philippine Liberation Ribbon, the Good Conduct Ribbon, the Asiatic-Pacific Theater Ribbon with one bronze star and the World War II Victory Medal. His discharge was 5 January 1946 at Camp Chaffee, Arkansas.”[DeKalb County Genealogical Society and Justin Potter Library, World War II Veterans of DeKalb County, Tennessee, (Smithville, TN: Bradley Printing, Co., 2005), 339.] He worked for the Veterans Administration in the maintenance department as a painter for twenty-six years. He was a member of the Upper Helton Baptist Church and was ordained a deacon there in 1962. [Obituary of Buford Vanatta, Smithville Review Newspaper, 30 December 1998.] Buford and Jessie Lee had four children listed below. Buford died on 22 December 1998 at University Medical Center in Lebanon, Tennessee, and was buried in Salem Cemetery, Liberty, Tennessee. Jerry Paul Vanatta was born on 24 August 1949 in DeKalb County, Tennessee. He married Barbara Gay Vanatta on 21 March 1969 in DeKalb County, Tennessee. Together they had three children. Libby Maria Vanatta was born on 20 May 1972. Libby married Daniel Kelly on 23 July 1994. Jeremy Troy Vanatta was born on 16 November 1977. Jeremy married Sarah Steffan on 17 July 1999. Ethan Vanatta was born on 16 May 1991. Joyce Ann Vanatta was born on 8 February 1953 in DeKalb County, Tennessee. She married John David Foutch on 13 July 1973 in DeKalb County, Tennessee. Together they had two children. Jennifer Elaine Foutch was born on 3 May 1974. She married Keith in 1999 and they later divorced. Daniel Ryan Foutch was born on 26 October 1989. Patsy Lynn Vanatta was born on 09 April 1954. She married Nicholas Hale Nokes on 14 April 1972 in DeKalb County, Tennessee. Nicholas Hale Nokes Jr. was born on 25 March 1976. He married Susan Springler on 27 October 1999. Kristie Diann Vanatta was born on 18 October 1971 in Murfreesboro, Rutherford County, Tennessee. She married Kyle Marcel Cantrell (born 31 October 1969) on 18 April 1991 in DeKalb County, Tennessee. Gertie Mae Hill was born on 11 March 1928 to Tina Clayborn Vanatta and Samuel Russell Hill. She married a man with the last name of McGee and lived in Lebanon, Tennessee, in 1980. She died on 10 November 2000. Paul Hill was born and died in December 1929 to Tina Clayborn Vanatta and Samuel Russell Hill. Russell Lendon Hill was born on 26 May 1931 to Tina Clayborn Vanatta and Samuel Russell Hill. He served as a Sargent in the US Army during the Korean Conflict. Russell married Corinne Netherton (born 25 September 1931) on 20 January 1951 in Rossville, Georgia. They had one child, Brenda Hill, on 22 December 1953. Brenda married Billy Nixon on 23 July 1971 in Wilson County, Tennessee, and they lived near Watertown, Tennessee in 2015. Brenda and Billy had one daughter, Rachel Nixon. Russell Lendon Hill died on 12 December 1996 in Watertown, Wilson County, Tennessee. 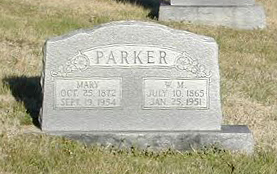 He was buried at Jones Hill Cemetery, Watertown, Tennessee. Clarence Edward Hill (called “Ed”) was born on 23 August 1932 to Tina Clayborn Vanatta and Samuel Russell Hill. He married Anita Gail Lawrence on 03 January 1969 in Wilson County, Tennessee, and lived in Watertown, Tennessee. Silas Vincent Hill was born on 8 March 1934 to Tina Clayborn Vanatta and Samuel Russell Hill. He married Melba Sue Arnold on 13 June 1964 in Wilson County, Tennessee, and lived in Watertown, Tennessee. Bobby Gene Hill was born on 15 May 1935 to Tina Clayborn Vanatta and Samuel Russell Hill. He died on 19 August 1986 and was buried at Hillview Memorial Cemetery in Alexandria, Tennessee.